It turns out that Microsoft's reorganization of its management, marketing, and PR structures weren't the only executive changes the technology giant had up its sleeve. Steve Ballmer, who took over the company in 2000 from Bill Gates, said Friday that he will step down from his role in the next year. He had no shortage of critics during his tenure. 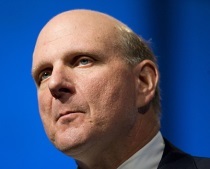 AllThingsD said Friday that Ballmer is leaving behind a “substantially weaker and less influential company” moving “down an uncertain path.” Former Symantec chief John Thompson will lead a search committee to replace him. Ballmer's resignation follows news broken by PRWeek earlier this week that the company will centralize its communications teams directly under industry heavyweight Frank Shaw, who serves as the company's corporate VP of corporate communications. PR leaders previously reported to their respective unit's marketing manager. Shaw noted earlier this week that Microsoft's PR agency relationships, including those with blue chip agencies such as Waggener Edstrom Worldwide, Edelman, and Burson-Marsteller, would not be affected by the reorganization. Communications industry insiders will be watching to see if that changes under a new chief executive, as well as how the company positions itself in a market moving further away from the PC every day.